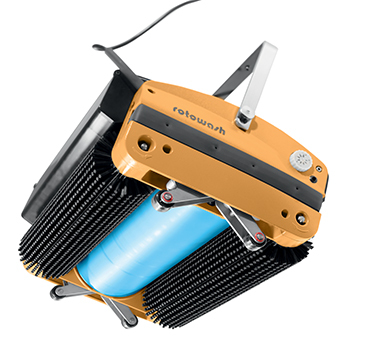 For over 42 years Rotowash floor cleaning equipment has tackled the hardest of cleaning jobs. 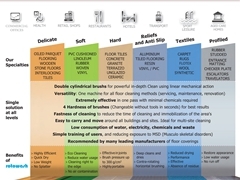 Whether it be cleaning soft, hard or un-even floor coverings from the list above, or you are looking for ways to improve your 'Green Cleaning Progam" with the benefits of up to a 90% reduction in water and chemicial comsumption compared to coventional cleaning methods. The key to our longevity, and global success has been the combination of our orginal, unique designed contra rotating brush system, backed by a skilled, and experinced team who are dedicated to exceeding our customers expectations. Rotowash understands that your business needs the ability to deliver efficient, effective, high quality results to your clients. With outstanding manoeuvrability all floors can be simultaneously scrubbed, rinsed and dried in a single pass. Our compact machine sizes make them it easy to transport which has always made it popular with cleaning contractors. Arrange a FREE demonstration to see how Rotowash can help maintain the hygiene standard in your health care facility. First impressions are vital. 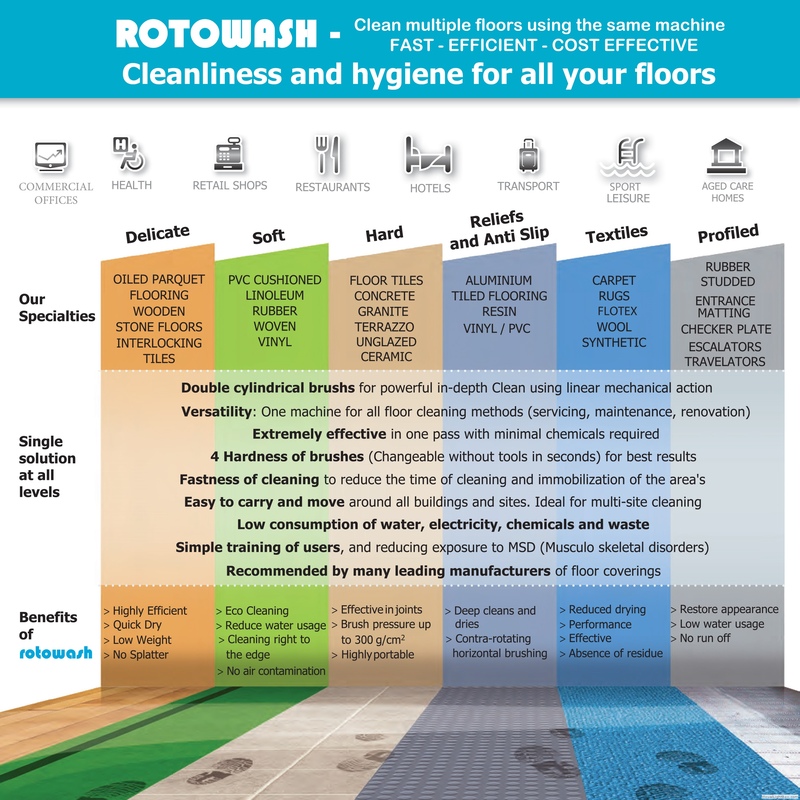 Request a demo and see why Rotowash can clean all floor types from your suites to your kitchens. Rotowash's unique design lifts your carpet pile and removes trapped soiling that creates those bad odours. Airports are high traffic and constantly being soiled. Rotowash can provide a unique cleaning solution for all floor surfaces. Fast, simple, safe and highly effective; see the results for yourself with a FREE demo at your site now. Easy to use for men or women. For clean presentation in high traffic shopping centres, car showrooms, workshop service centres, offices building; think fast, efficient, easy to use Rotowash. Blood, sweat and tears. A clean and healthy environment is all important with such high traffic and constant soiling area's. For stadiums, exhibition areas, pubs, clubs, and function centres it's vital to provide clean, well presented areas. First class appearance and hygiene are vital to success in these industries. Inside & Out - Carpets, tiles, stone floors, concrete and patios, wooden decking, drive ways and garages, swimming pool area's. 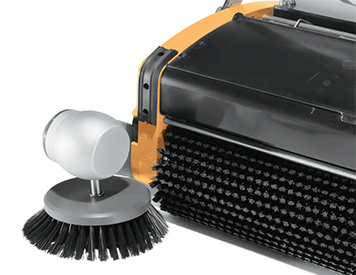 A Rotowash provides effortless cleaning and as easy to use as an upright vacuum cleaner. Cleanliness, health and cleaning-speed are your school or university’s top priorities, our machines will help you achieve these goals. 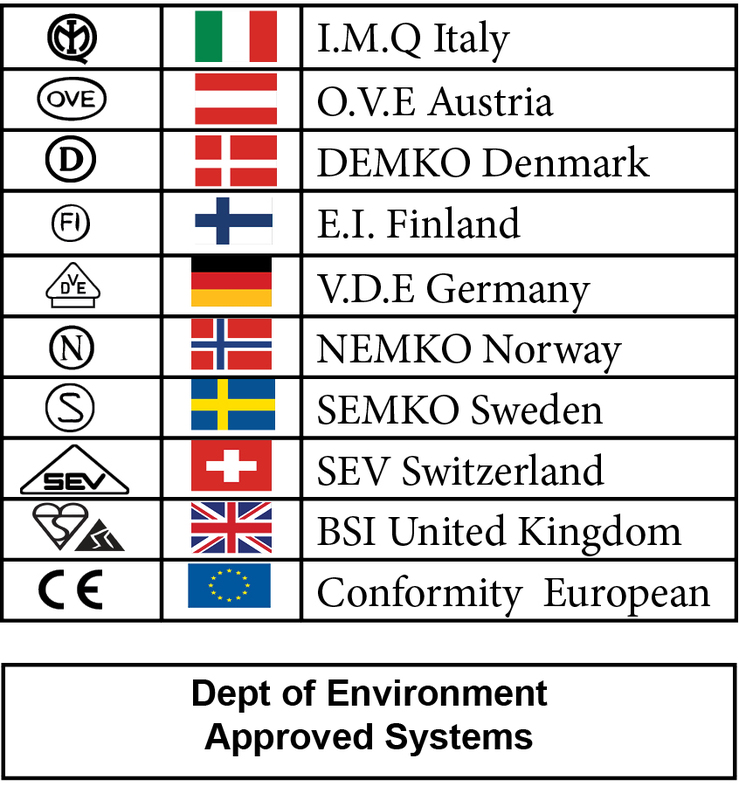 These industries are scrutinised for regulatory compliance requiring the highest hygienic standards. Rotowash provides an efficient and highly effective solution to maintaining the standards required.